My UPS guy called yesterday morning and let me know that a friend of his was moving and had some canning jars they didn’t want to take with them and did I want any. Well, of course I do. So I loaded up some boxes for the loose jars, headed over to the moving house, and loaded up on about a gazillion FREE canning jars that I promptly shared with a few friends. Not a bad birthday gift. :) There were only a handful of pint jars, so I’m still looking for pints. Heck, I’d be willing to trade some quarts for some pints. Guess it pays to give your UPS guy jam for Christmas so he knows you can. Or maybe he delivered while I was in the garden or canning something, I don’t know, but I’m glad he knew who to call when there was a stash of canning jars that needed taken. lucky lucky girl! :) Congrats on an awesome gift. WTG, what a wonderful score! Sweet! My husband says "free" is his favorite 4-letter word! Excellent score and Happy Birthday! Nothing like free canning jars to start the New Year! Oh, and happy Birthday, my friend! OMG, UNBELIEVABLE!!! I wish I could be half as lucky!!! Wow, Nice!! I hope you had a great birthday! Take a look at the "freecycle" system. I think the lead in web page is http://www.freecycle.com. This is a system made up of many, many nodes across the U.S. If you have something useful you don't need anymore, you list it as "offered" and if you have something you need, you list it as "wanted." Then the system matches you up with the right person in your geographic area. 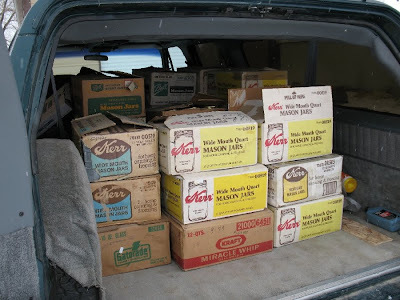 I have frequently seen canning supplies, construction materials, furniture, electronics, etc. listed. No one can sell anything or barter, it is straight "free." It provides a means for people to keep from throwing useful items in the dump. Maybe you could get things you could use that way. You don't have to tell people where you live, just meet them in a grocery store parking lot or some other neutral place. I have met some really nice people this way. I talk about my canning and share also – and YES, it has brought about lots of free canning jars! And yes, I share too, but like you, can never have enough pints! I give the quarts to my son who makes canned soups for his family of 4 kids :) So I take them ALL!!! You lucky girl! I'm so jealous of all those jars…wow what a score!! Happy Birthday hun! Tomorrow is mine…maybe I'll have a nice little coup too! Hermit–I have checked out freecycle here and there's only been 2-3 ads on at any one time–just not enough people in my geographic area taking advantage of it yet. Definitely a good system and worth checking out especially if you live in or near a more populated area. Score! What a wonderful gift!